I haven’t stayed up to watch “Saturday Night Live” in years. The most effort I’ve put into watching the show was when Justin Timberlake hosted; but SNL is so far under my radar, I even missed his last appearance. I wanted to witness Sasheer Zamata’s debut. I wanted to see where what Drake’s acting chops are now, knowing that he first entered the entertainment industry as an actor. The interview with Fallon brought into focus something I’ve always known about Drake: he constantly exists in a state of binary worlds. Most obviously, he’s bi-racial. Another dimension of that identity is that he’s Jewish and Black. He sings and he raps. This is what I initially thought was his talent jackpot – being able to rap to the appeal of men (“Started From the Bottom”) and sing to the appeal of women (“Hold On, We’re Going Home”). His music is pop-friendly and authentic hip hop at the same time. 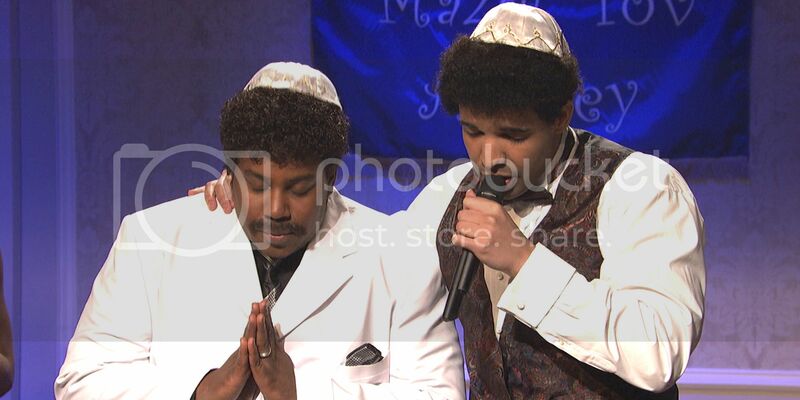 The first sketch on SNL played to the dual existence that is Drake, as he’s shown rapping at his own bar mitzvah, recounting his experiences of being a young, Black and Jewish Canadian kid. It was a great showcase of skills, both as an actor and hip hop artist. It all made sense to me as I realized why essentially everything about Drake works: he is a masterful code-switcher. Code-switching is a form of bilingualism. It is a skill that is used to traverse different environments through language (or codes). As a Black woman in America, it’s something I know all too well. I have learned to speak in the codes of Standard American English (SAE), African American Vernacular English (AAVE), and the heavily accented code my Honduran-born family speaks in. Weaving through all three codes is something I do almost daily, most times without giving it a second thought. Put simply, code switching happens when the way you speak amongst your friends over dinner is different than how you’d converse with your co-workers in the boardroom at your corporate office. In Drake’s case, the way he spoke to Jimmy Fallon is worlds apart from the way he raps in his songs. Different environment, different language – but both equally true to who he is. Code switching is not a method to deny or hide your identity, but more of a way to adapt to different environments and navigate the varying worlds you exist in. The act of code switching is not relegated to only African Americans, as many people from different cultures and ethnicities do it. National Public Radio (NPR) run a blog exclusively dedicated to sharing the stories and experiences of those who exercise this skill, and it even attempts to explain the top five reasons why people code switch. I am not suggesting here that you will be wildly successful and make millions of dollars if you code switch. It’s merely an observation on my part that it is seemingly what is working for Drake’s career, as it gives him a chameleon-like appeal across genres and audiences – all while staying true to his multiple identities. Watching him in action and their hiring of Ms. Zamata still won’t make me excited enough to tune into Saturday Night Live every week, but they got my viewer count this time around. Amber L. Wright, M.A. is an adjunct professor, writer, communication coach and creator of TalktoAmber.com. Her personal mission is to teach you how to be hear and be heard in every of your life - from the boardroom to the bedroom. Wright’s areas of interest and expertise are in communication, relationships, marriage and popular culture.